So today begins my episode recap/review series of the much anticipated P.A. Works/Aniplex original production, Angel Beats. Beginning its run this past Saturday, Angel Beats will be a 13-episode show that is accompanied by a significant amount of alternative media goodies including several illustrated short stories and two manga series which we will eventually get around to reviewing. Many anime and visual novel fans will be very familiar with the story’s creator (Jun Maeda) and original character designer (Na-Ga) of associated Key fame stemming from such well known works as Kanon, Air, and Clannad (and in Na-Ga’s case definitely think Little-Busters). You might ask why someone like me who has never experienced any Key works and has honestly only watched one Visual Novel anime adaptation (Higurashi) would be so interested. Well, lets just say I can’t help but be interested in shows that attempt to do novel things with somewhat stereotypical premises. 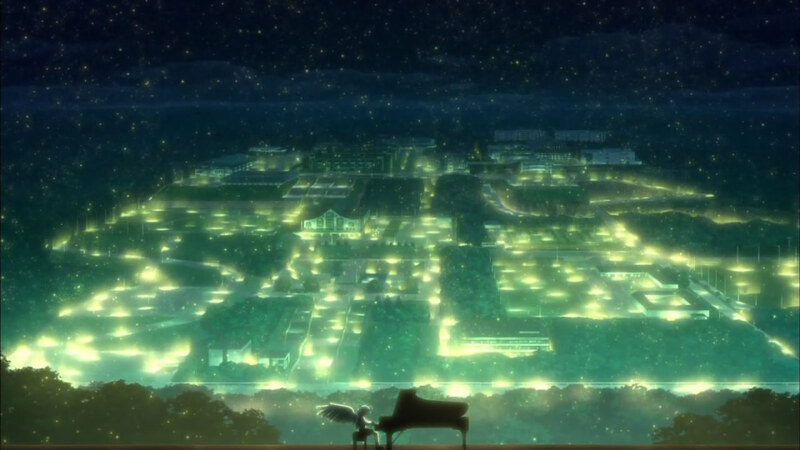 Shows of this nature can often result in stunning success (for me So Ra No Wo To), or sometimes just straight up fails to deliver (think Dance of the Vampire Bund). 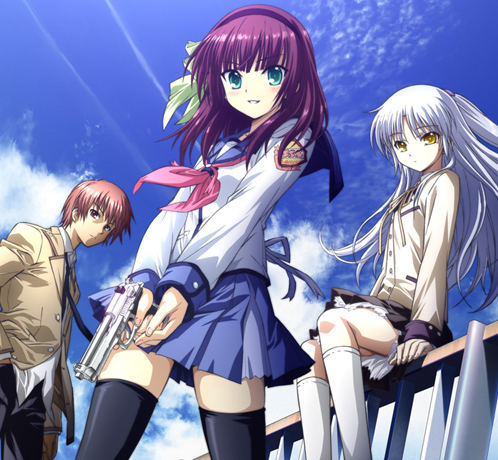 In Angel Beats you have a show that is going for the big one by mixing it all together, just in the first episode you get almost equal doses of yet another high school setting, supernatural drama and mystery, action (Guns! Handsonics? ), physical comedy, rock bands, and the yet another ahem, “different” interpretation of the afterlife. I have to admit that along with the premise the concept art and TV spot trailers suckered me in as well, you can find these here, here, and most poignantly here (pretty muzak in all these).